*Details for Cannons in Your Community games will be posted to respective pages as information becomes available. To purchase tickets, call (617) 746-9933 or email us: tickets@bostoncannons.com. Watch live on Lax Sports Network. ADA accessible seating is available. Guests who require accessible seating should contact the Boston Cannons Ticket Department to purchase those seats in advance. All children who require a seat require a valid game ticket for admission. Generally, age 3+. Alcohol is not allowed to be brought into the Stadium, but is sold throughout concessions. Alcohol is permitted in parking lots and designated tailgating areas. Consumption of alcohol by underage drinkers will not be tolerated. There is only one ATM available and this shuts off at 8pm. Please plan cash accordingly. Concession stands are located throughout the Stadium concourse. Currently, only cash is accepted. Personal checks are not accepted. Boston Police and ambulatory services are on scene for all home games. For minor first aid situations, please see the Boston Cannons Fan Services Tent. Gates to the stadium open one (1) hour prior to opening face-off. Admission into the Stadium is only available through the Main Gate. All ticket questions or event-related problems should be addressed at the Cannons Fan Services Tent located in the Fan Zone. 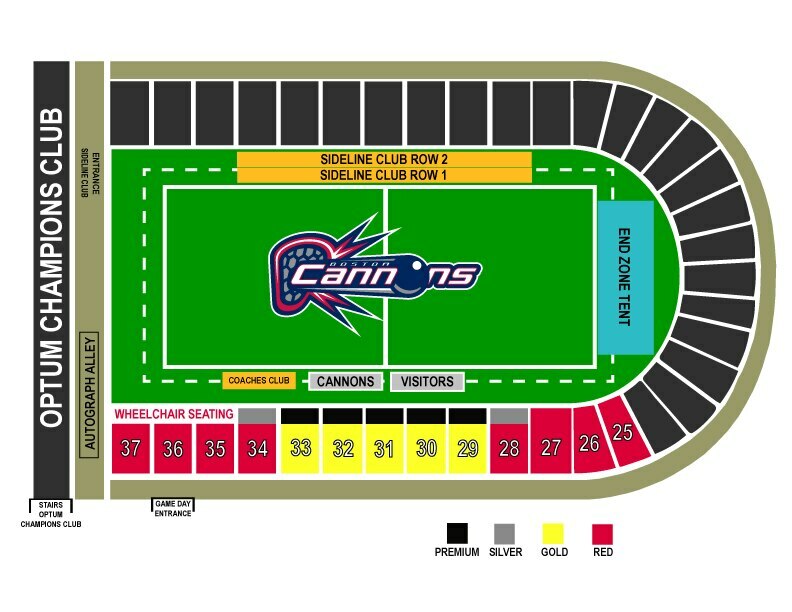 On game days, the Boston Cannons Will Call and Box Office is located outside of the Stadium, adjacent to the Fan Zone. Will Call and the Box office typically opens four (4) hours prior to opening face-off (Subject to change) and remains open through halftime. All tickets are full price at the Box Office. Cash, debit cards, and credit cards are accepted. Personal checks are not accepted. To pick up your tickets at Will Call, you must have a valid photo ID and a smile. Lost and found is located at the Cannons Fan Services Tent located in the Fan Zone. Please contact the Cannons at 617-746-9933 if you lost an item during the game. The Cannons are not responsible for lost or stolen items but will assist in recovering the items as best as possible. Cannons merchandise is sold in two locations - at the Merchandise Tent located in the Fan Zone and the Merchandise Tent located in the concourse. Cash, Debit/Credit Cards, and Apple Pay are accepted. Personal checks are not accepted. Parking is available on Harvard's campus and is free for all fans. There is a VIP parking lot designated with ticket entry required. All permitted items are subject to inspection. Permitted items include purses, backpacks, blankets, lacrosse sticks, seat cushions, diaper bags, video cameras and fanny packs. Umbrellas are not allowed inside the stadium, nor are pets unless they are service animals. Prohibited items include bottles (glass or plastic), cans, thermoses, coolers, alcoholic beverages, outside food or drink, large bags, folding chairs, professional video cameras including tripods, chains, illegal substances, laser pointers, clothing containing vulgar language, fireworks, aerosol cans, pets, pepper spray, toy weapons, weapons of any kind, and any item deemed by management to be dangerous or inappropriate. There is no re-entry once you've left the stadium. The resale of tickets at any Cannons game is strictly prohibited. Restrooms are located throughout the Stadium concourse. All fans in attendance may be subject to increased security measures when entering the stadium. Please plan to arrive earlier than normal for the game, as enhanced security measures may delay access into the stadium. Smoking is prohibited in all areas of the Stadium. Tailgating is allowed in the Stadium parking lots and designated tailgating areas. Grills using charcoal are prohibited within the athletic complex. The maximum propane gas cylinder size allowed will be 20 pounds. Tents and tables are allowed. In the event of rain, the game will continue play through the rain. Should there be thunder and/or lightening, the game will be stopped and play will resume 30 minutes after the last sight/sound of thunder and/or lightening. If the game cannot be played due to weather, act of God, or any other reason, your ticket will allow you entrance to the rescheduled game. Tickets cannot be refunded or exchanged for another Cannons home game or cash value.